Snrky: QA gave me the balloon. QA gave me the balloon. Testing parties are never as much fun as they sound, even when jazzed up with food and an appropriate number of breaks. While they're incredibly useful for surfacing issues, they never seem to happen - in my experience - until too late in the process when they create big spikes in the bug count that can't be accommodated under the normal capacity and velocity. And because they're bugs and they're late in the process, they're given a significant weight which derails everything else that's been planned. While they seem timely to those doing the testing, they're not at all timely for developers who are on the bottom of the process. I've often wondered why we don't just do a developer testing party earlier in the process to head it all off, but I suspect it's one of those "I have to see it to give it a priority" issues where, because they were developer surfaced, the issues would just get a lower priority or be "found again" later in the product cycle. 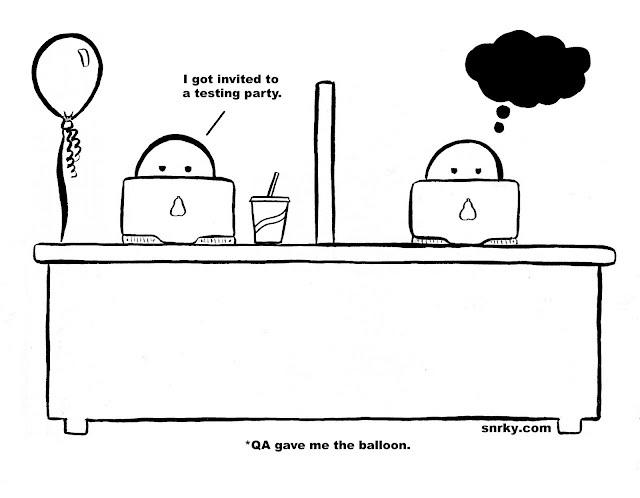 Title: I got invited to a testing party. Snarky: QA gave me the ballon. Prioritization is an important part of the tester. This is especially important if the company is working on a system Agile. I was recently a customer for these guys http://www.nixsolutions.com/services/quality-assurance-services/. They tested my software, made it onto top. It's been 4 months, and critical bugs I did not find.